lkkaku Madarame: the hilt of his zanpakuto as he'd drawn near. Ikkaku damn sure wasn't about to hold back, so he could only expect the same in return. lkkaku Madarame: collide, that is unless one of the two would likely outsmart the other before that second came. lkkaku Madarame: technique fail, he would only go so far, namely to the left of his opponent. There would simply be nothing more that he could do than to just take a free swing at his foe, hoping to make some contact. lkkaku Madarame: captain. Before he knew it, he'd reappeared, both feet on the surface—now just having to worry about that particular spot he'd landed. lkkaku Madarame: left hand in attempt to help fend himself off for any counter-attack that could be at hand. 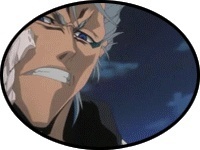 Hidden Bankai: least your not like Yura...Who cheated...."
lkkaku Madarame: whatnot. But we're not here for small talk. Strictly business, right? Although business does look good about now." A grin came upon his lips as he rested the blade up Houzukimaru upon his shoulders. lkkaku Madarame: goes to you as well provided, I attain that rank." 2000 SP + 3000 SP for the hour, + 350 SP for seven turns. 5350 SP awarded to you both.